During my years as a college undergrad, every family gathering orchestrated by my mom always featured a gigantic box of éclairs or petit fours from Schmidt's Pastry Cottage. While I'd sampled these bite-sized treats many times as an adult, I never took the time to fully explore what Schmidt's really had to offer until recently. As it turns out, they're proficient at quite a bit more than the cream-filled pastries that were common fixtures during Super Bowl Sunday. The South Jordan location is where I made my move. The space used to be home to Grandpa Maddox Restaurant, a mid-level steakhouse that saw a lot of traffic from my folks when they wanted to get their prime rib on. In all honesty, seeing the bygone steakhouse now as a family-owned bakery had an unexpected impact. Although Schmidt's makes a lovely first impression with its wall-to-wall display cases—more on this later—the dining area lacks the inviting, cozy atmosphere that comes as naturally to most bakeries as dough hooks and flour-dusted aprons. From a decorative standpoint, the juxtaposition of a deli/bakery superimposed over the white marble of a defunct dinner destination makes for a bit of ambient dissonance. I took my 1-year-old daughter in for a chicken pot pie ($7.99) and a grilled cheese sandwich ($3.99), and eating in this vast dining hall that was meant for dinner with a capital D—vaulted ceilings, dark wood flooring and a large gas fireplace—just made me feel weird. The dining room maintains the hardened edge of an egocentric steakhouse, and it doesn't play nicely with Schmidt's menu of comfort-food staples. Perhaps the best thing about the food at Schmidt's is that it's very aware of itself. Just because you're eating in a huge, marbled dining room doesn't mean the proprietors feel like they should jack up the prices. I've had similar chicken pot pies before—flaky puff pastry stuffed with thick gravy, peas, carrots, potatoes and chunks of chicken—but have paid twice as much for them elsewhere. It's a solid rendering, though with a small piece of crust plopped on top, it's not very pie-like. I always get a little irked when places serve up a dish that's more like biscuits and gravy and call it a pot pie—it's a proclivity that likely resulted from some unaddressed childhood trauma. Regardless, it's a hearty, filling meal for under 10 bucks, and I'm always down for that. If you take a wee one of your own with you, the kid's meal is actually pretty awesome. My daughter's meal included a grilled cheese sandwich, a juice box, some applesauce and a toddler-sized cupcake she did not want to share. She's a fan of food that is to scale with her miniature frame, so she enthusiastically got her meal all over the place (sorry, Schmidt's So-Jo). A quick pop into the Schmidt's lobby, with its perimeter of sumptuously stacked displays is more closely aligned with the bakery's brand. As the name implies, Schmidt's offers German pastries as well as a lineup of usual suspects. 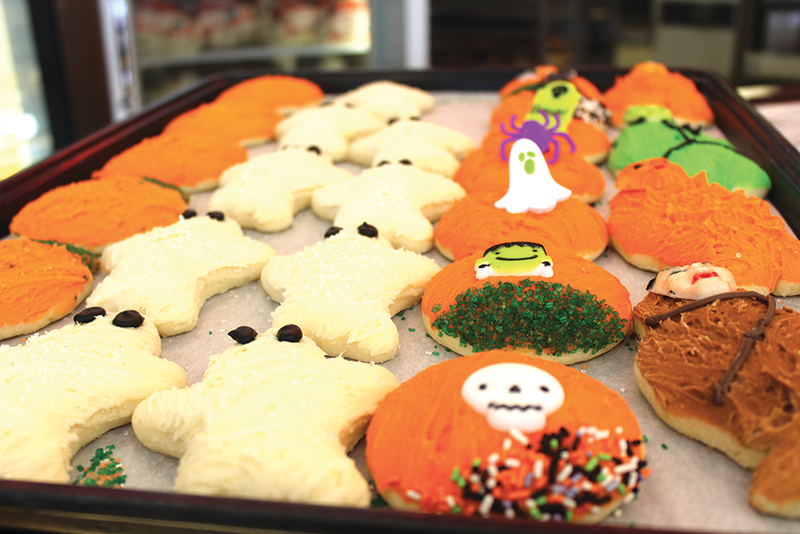 Slices of bienenstich ($1.55) sit side by side with pumpkin spice doughnuts ($.75); raspberry-filled toscos ($1.10) rub elbows with lemon bars ($.75), and marzipan cake ($3.49) flirts demurely with the Halloween-themed sugar cookies ($1.20). Indeed, the strength of Schmidt's comes from its variety, all of which is on colorful display. As the pastries at Schmidt's are more than reasonably priced, it's difficult to not simply ask for one of everything and be on your way. For those in need of a slightly less caloric indulgence, I can vouch for the toscos—small rectangles of white cake stuffed with raspberry and bookended with chocolate. They're a pleasant combination of cookies, cake and brownies so they're ideal for people who aren't quite sure what they want to get. If you've never had the chance to try beinenstich, Schmidt's is a good place to start. They're a bit heavier on the buttercream than I like, but all in all, this is a solid pastry that isn't as widely available as it should be. Those looking for dessert that eats like a meal will want to turn their attention to Schmidt's menu of plated desserts for all their gooey, sugary, melty desires. The king of this particular court is the Holy Schmidt ($38.99) which is a 9-inch, two-layered cake topped with nine scoops of ice cream, hot fudge, caramel, whipped cream and cherries. Essentially, the folks at Schmidt's wanted to combine a gigantic sundae with a gargantuan cake and let their ingenuity be their guide. They have a smaller version called the Mini Schmidt ($5.99) that's much easier to handle if you're flying solo. I can't stress this enough: If you're on your own, do not get the Holy Schmidt. Overall, I recommend a casual pop-in to the smaller Taylorsville (5665 S. Redwood Road) and Sugar House (609 E. 2100 South) locations for something sweet to get you through the day, or to preorder a variety of baked goods for your next social gathering. The South Jordan location offers a more diverse menu, and it's the only one of their locations where you can get the mythic Holy Schmidt, but I'd love to see more color in the dining room to match the vibrant display area. Regardless, Schmidt's remains one of the better options for indulging your sweet tooth.